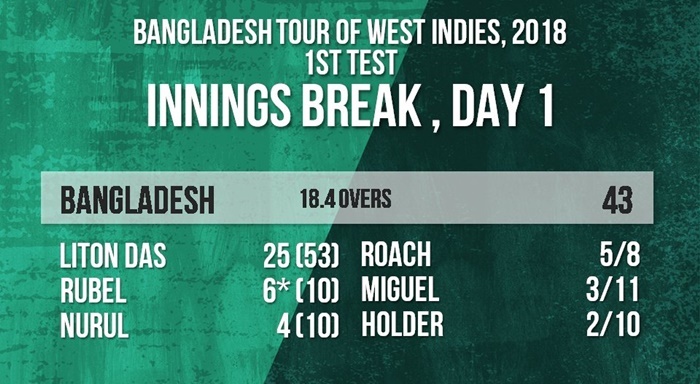 Bangladesh were bowled out in 18.4 overs yesterday. That’s pretty bad, but apparently it wasn’t actually the shortest first innings in Test history. Imagine how bad at cricket you’d have to be to be bowled out inside 18.4 overs. Imagine how embarrassing that must have been. Hopefully, whoever it was, they weren’t playing a big match against a bitter rival because that would have been unbearable. 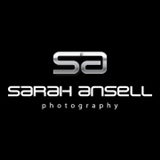 All out in under 18.4 overs. It’s almost beyond comprehension. No, wait, it’s almost beyond belief – it most definitely is beyond comprehension. 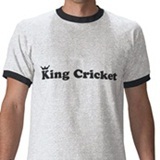 In a Test match there is no obligation to score runs at a quick rate. You can just block the ball or leave it. You can all but remove risk from your game. With that option available to you, how could you possibly lose a wicket more frequently than once every two overs? That’s not just rank incompetence, it’s sustained rank incompetence from an entire team of players selected because they are the most competent that nation has at its disposal. Chin up, Bangladesh. You’re not the most embarrassing cricketers of all time. Who would have thought this match would turn out exactly as everyone expected it to? What were the odds on that? Extremely slim, you’d have thought, what with the extraordinary wealth of alternative outcomes. Tamim Iqbal played a good innings and there was reasonable support from one of Bangladesh’s middle-order stalwarts, but they ultimately fell short of the mythical ‘par’. India’s top three then chased down the target. It was all as predictable as the punchlines in one of those new sitcoms where they seem to have spent so much time trying to mimic the style of an old sitcom that no-one’s actually found a minute to write any jokes. India will play Pakistan in the final. It seems unimaginable that it won’t pan out exactly how the group stage game did. Pakistan’s fabled unpredictability will make people think that this won’t happen, so Pakistan will of course feel moved to prove everyone wrong by ensuring that it does. 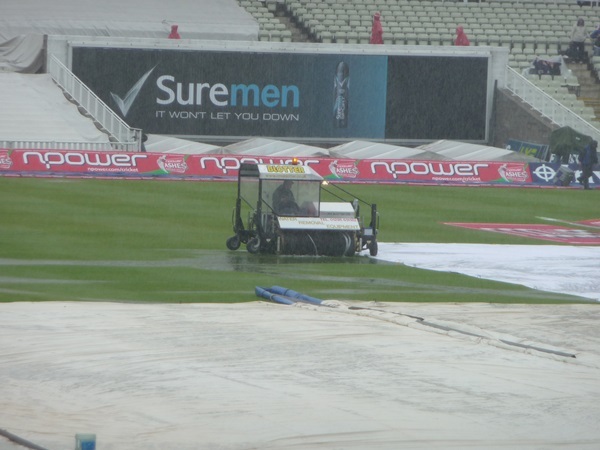 After a dominant performance against Australia/New Zealand and a narrow victory over Australia/Bangladesh, the British Weather has booked itself a place in the semi-finals of the Champions Trophy. After displaying dreadful, relentlessly sunny form throughout May, UK meteorologists were left fearing that their side would be knocked out during the group stages. But there’s a reason why bookies fear the UK climate and it has pulled two magnificent performances out of the bag to move through to the last four with games to spare. As so often, the hero in the match against Australia/Bangladesh was Regular Outbreaks of Rain. As the required run-rate dropped, it steadily imposed itself on the game until the result was in no doubt. With Heavy Cloud Cover and Bad Light set to perform alongside each other in the semi-final after being unavailable for this day-night game, the British Weather will have high hopes of making the final, no matter who it comes up against. Bangladesh have won nine Tests and we make this their second win. The convention is to remove matches in which Bangladesh feature from all Test statistics. This seems unduly harsh at the best of times, but it seems even more so when it’s them who you’re measuring. Nevertheless, in the spirit of omission, we’ve stripped away all of their Test victories that might be disregarded for one reason or another and we’ve been left with their win over England last October and this one against Sri Lanka. Truly, it is Bangladesh’s Golden Era. For the record, the Tigers’ other seven wins comprise five against Zimbabwe and two against one of those stand-in West Indies teams, which on this occasion featured luminaries such as Omar Phillips and David Bernard. Steve Smith has suffered another horrendous brain fade, leading to grave concerns about his long-term mental health. 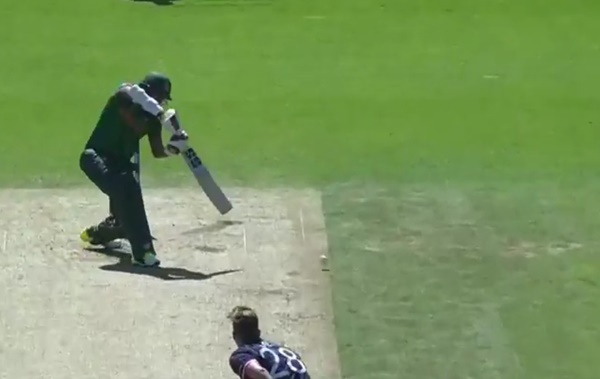 Smith calmly held his bat out of the way of a ball pitching outside leg, only for it to hit his off stump. If this brain fadery continues at its current rate, it will be but weeks before he’s entirely forgotten how to execute his magnificent double-elbowed chicken dance bowling action. As this is the only aspect of Steve Smith’s cricket in which we take any pleasure, we’d be keen for him to seek psychiatric treatment post-haste. 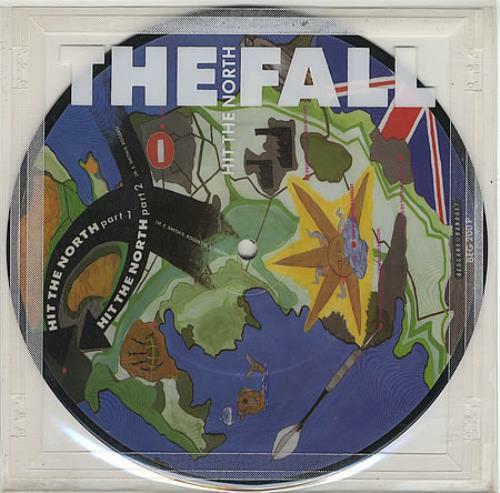 One of the few things that people agree upon about the lyrics of The Fall’s Hit the North is that one of the first lines is “my cat says eeeeee-ack”. So what can we agree upon about the South’s hitting of the North’s bowlers today? That it was more successful than the North’s hitting of the South’s bowlers, we suppose. As for the relative northern- and southernness of these supposedly representative sides, we remain unimpressed. The birthplaces of the North’s batsmen – Hong Kong, Kent, Transvaal, Cumbria, Shrewsbury, Bristol – don’t hint that too many of them would pass our patented ‘butter-bath’ test. Because what is the supposed North-South divide about, if not monophthongs? Elsewhere, SHAKIB AL HASAN earned himself a bit of impulsive upper case usage after making a hundred and giving Bangladesh a first innings lead over Sri Lanka. He’s one to watch. Mark our words. New Zealand and South Africa are also Testing each other. Looking at the scores so far, we’re hoping the pitch is hinting that it might be the kind of flattener on which Nathan Astle did his thing. You never know. Relatively speaking. Escape with a draw and that’s basically a win for the tourists, isn’t it? And being as it’s a one Test series, that would also mean a Bangladesh series victory. Again, relatively speaking. Three sessions seems an awful long time when you’ve only got seven wickets left though. Three fifth day sessions. Three fifth day sessions with R Ashwin bowling at you. When you’re Bangladesh. So, in other words India are seven wickets away from victory. In fact, being as most of you will read this on the daily email which won’t go out until mid-morning on Monday, check the scorecard – India have probably won. It’ll be funny if they don’t though. All these big India tours this season and Bangladesh were the ones who stood the best chance of escaping with a draw. Sometimes we forget that you haven’t all been reading this website since day dot. It’s been over a decade since we tipped Shakib al Hasan for greatness so chances are a great many of you won’t know what a big deal it is that he made a Test double hundred against New Zealand this week. If Shakib’s still not exactly a household name, he was all but unknown back when we tipped him. We’re talking Cricinfo-didn’t-even-know-his name obscure. Was he Sakib al Hasan, Shakib al Hasan or Saqibul Hasan? Having already used up our full allocation of precognition, we initially went with Sakib al Hasan before switching to Saqibul Hasan when it seemed more likely that was the one that would stick. Cricinfo also had him down as a medium-pacer back then. We did at least work out that that one was wrong. After 217 off 276 balls, Shakib’s Test batting average is now 41.39. That’s unspectacular in isolation, but combine it with a bowling average of 32.37 and it’s actually really rather special. Shakib also saw fit to draw his innings to a close by succumbing to another Cricketer of the Realm, The Great Neil Wagner. Test innings don’t come much better than that. Imagine that today is exactly like today only Moeen Ali made a duck. There, you see – things could be slightly worse. This isn’t so much a ‘glass half full’ attitude as a ‘there’s still something in there, I’m sure – maybe if I tip the glass the right way for long enough the minuscule droplets will gather and form something visible in the corner’ attitude. You work with what you have. An increasingly polluted world continues spinning. 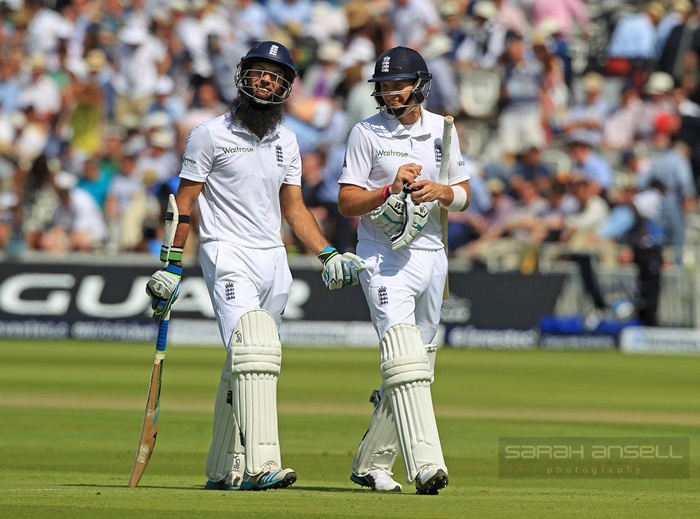 As do R Ashwin and Ravindra Jadeja, for England have managed to bat out a full day of Test cricket. Big first innings and a game that accelerates alarmingly as it approaches its denouement. That’s our prediction. Predictions are for fools, of course, but there are so many fools these days that the addition of another one won’t tip the balance. Joe Root made a hundred, incidentally.